Skye Gravestones | Mary & John Macinnes, ss. Alexander & Lachlan. Mary & John Macinnes, ss. Alexander & Lachlan. 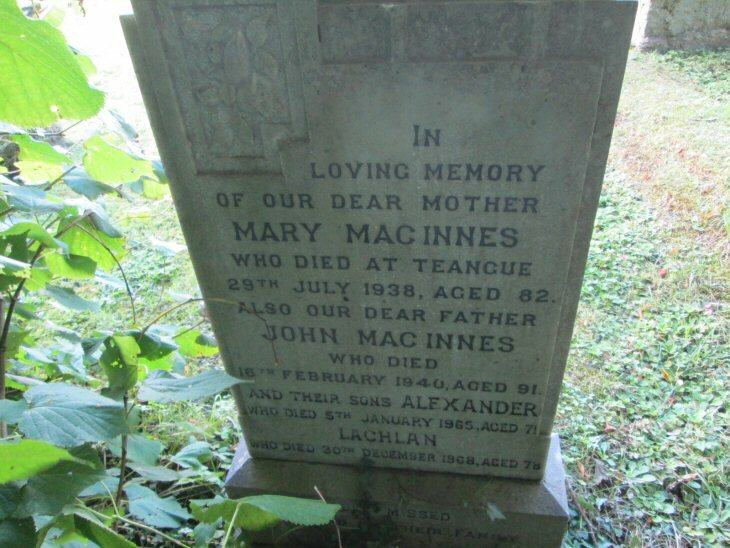 In/loving memory/of our dear mother/MARY MACINNES/who died a Teangue/29th July 1938, aged 82/also our dear father/JOHN MACINNES/who died/16th February 1940, aged 91/and their sons ALEXANDER/who died 5th January 1965 aged 71/LACHLAN/who died 30th December 1968 aged 78.